Crock Pot Spaghetti Squash is so easy to make and so much cheaper than buying frozen spaghetti squash from the grocery store. Last week one of my daughters asked me if I wanted to go with her to a certain large box store. She was shopping for bagged frozen spaghetti squash. Sometimes it amazes me how much money a person can waste because they buy a product at the store instead of making it themselves. My daughter cooks in a crock pot all the time so I thought she would appreciate some Mom advice. I said to her – Do you know how easy it is to cook squash in the crock pot? She looked at me and said why would I cook it in the crock pot when I can just buy a bag of frozen spaghetti squash at the store? What is a Mom to do? I can’t even begin to list the many reasons why she should make her own spaghetti squash at home in the crock pot. The one reason I replied was because it is cheaper. Just so happens the store didn’t have any of the frozen spaghetti squash. Two days after this little shopping trip was her birthday. Guess what Mom gave her? Yep, you guessed it. LOL She got a bunch of Crock Pot Spaghetti Squash to freeze in individual serving sizes. During the fall I made Crock Pot Butternut Squash and Crock Pot Pumpkin Puree so I knew how easy it is to cook squash or pumpkin in a slow cooker. Especially squash that has a very thick skin that is difficult to cut. I love just about any type of squash but would struggle with a very sharp knife to cut winter squash open before baking in the oven. I love to eat butternut squash with a little butter, brown sugar and cinnamon sprinkled over it but cutting it open really made me nervous. I just knew one day my knife was going to slip and I was going to lose a finger. Now that I know how easy it is to cook squash in the crock pot I will never struggle to cut a raw squash open again. This crock pot method works for all type of squash and pumpkin. 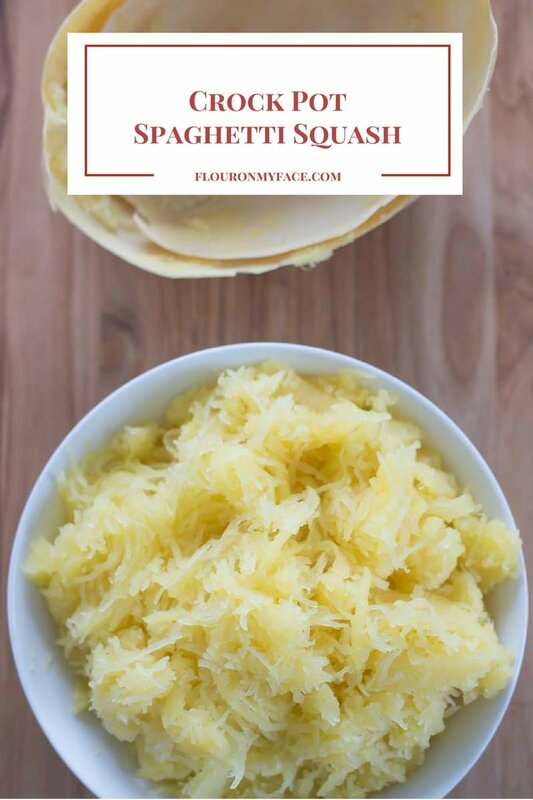 Spaghetti squash is a great low carb option that can be used in place of pasta. 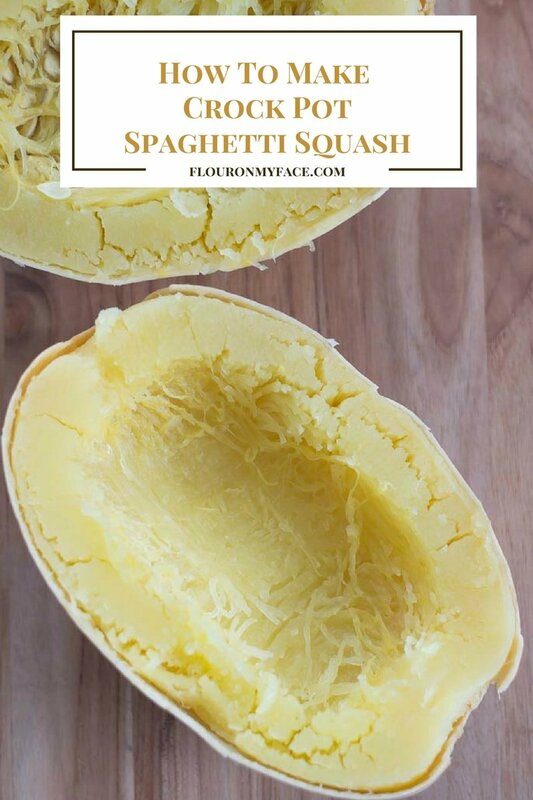 Serve the cooked spaghetti squash with your favorite pasta or alfredo sauce for a low carb lunch of dinner recipe. Scrub the outside of the spaghetti squash well to remove any dirt. Place the whole uncut spaghetti squash in a large crock pot. Cook on high for 3 to 4 hours or until you can easily pierce the skin. Using tongs carefully remove the squash from the crock pot and allow to cool. Once cool cut down the middle and remove the seeds and strings. Using a fork pull the spaghetti squash flesh from the hard shell. A medium squash will yield 6-8 cups of flesh. Crock Pot Spaghetti Squash with a video to show how easy it is to cook thick skinned squash in the crock pot. 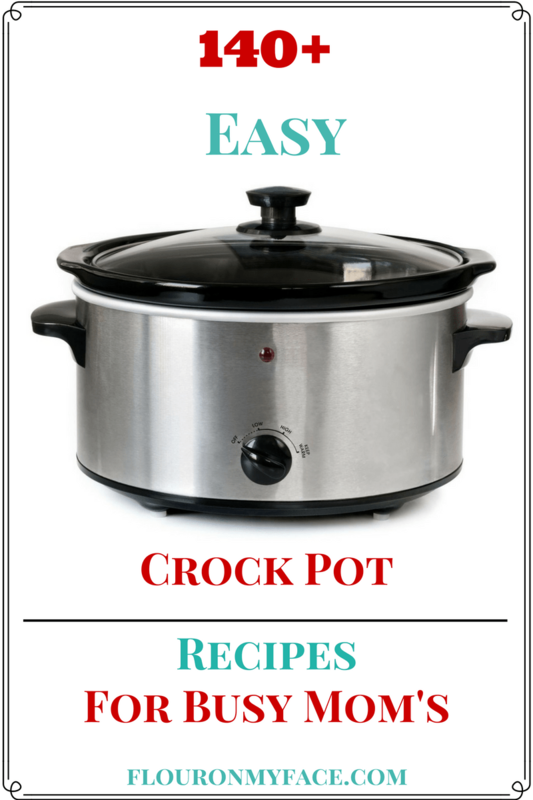 Are you a busy Mom looking for more easy crock pot recipes? Check out my Crock Pot recipe page where you will find over 140 easy crock pot recipes.